Probably the most wanted skin care range ever, Drunk Elephant is worth the hype – and then some... Founded by Tiffany Masterson, who wanted a clean break from toxins and the ‘Suspicious 6’ (essential oils, drying alcohols, silicones, chemical screens, fragrance/dyes and SLS) this brand has created a whole new category in the beauty space: ‘Clean-Clinical’. 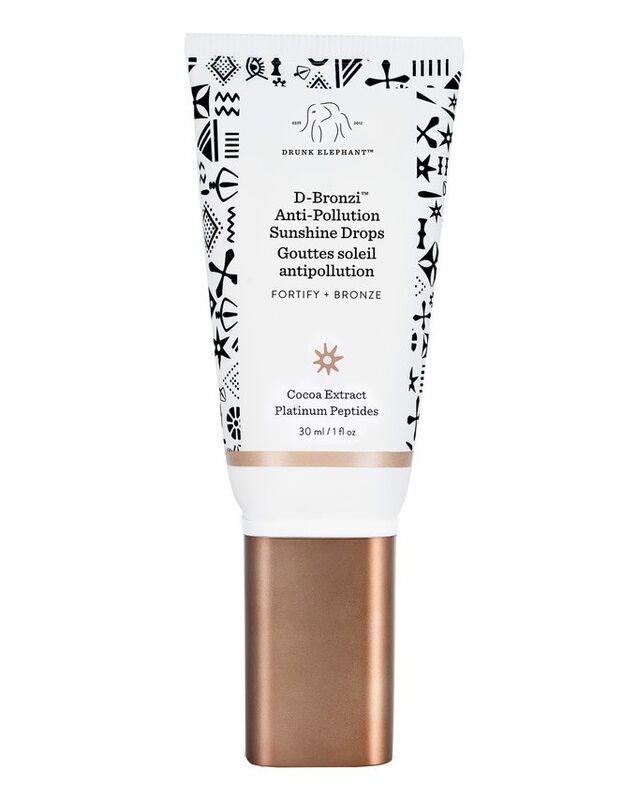 Delivering sunshine's bronzy colour without the damage, D-Bronzi Anti-Pollution Sunshine Drops are an easy way to get a sun-kissed glow without the long-term consequences. You asked and we've answered... introducing Drunk Elephant's beloved D-Bronzi Antipollution Sunshine Drops which grants sunshine's enviable bronzy glow without the damage! An easy way to get a sun-kissed glow without the long-term consequences, this hard-working product is formulated with a chronopeptide that mimics the antioxidant benefits of vitamin D, omega-rich virgin marula and black currant seed oils, along with vitamin F (fatty acids), which immediately replenish the delicate balance that supports a healthy barrier function of skin, while a concentrated mix of protective antioxidants boosts skin’s defences against pollution and environmental stressors…all delivered with a bronzy finish. D-Bronzi’s just-got-back-from somewhere glow flatters every complexion! Add a drop or more of D-Bronzi to any Drunk Elephant serum, sunscreen, oil or moisturiser for a gorgeous glow and a potent dose of protective antioxidants and omega fatty acids. P.S. D-Bronzi is a mixer and is way too concentrated to be used alone, Add a drop or more to any of our serums, moisturisers, sunscreens or our Virgin Marula Oil for an all-over sunshiny glow on face and body. Water/Aqua/Eau, Hydrogenated Polyisobutene, Glyceryl Oleate Citrate, Mica, Hydroxyethyl Acrylate/Sodium Acryloyldimethyl Taurate Copolymer, Glycerin, Ribes Nigrum (Black Currant) Seed Oil, Sclerocarya Birrea Seed Oil, Theobroma Cacao (Cocoa) Extract, Caprylic/Capric Triglyceride, Vitis Vinifera (Grape) Seed Extract, Lecithin, Acetyl Tetrapeptide-17, Linoleic Acid, Linolenic Acid, Sorbitan Isostearate, Camellia Sinensis Leaf Extract, Maltodextrin, Sodium Hyaluronate Crosspolymer, Magnolia Officinalis Bark Extract, Glutamylamidoethyl Imidazole, Colloidal Platinum [nano], Tocopherol, Phenoxyethanol, Pentylene Glycol, Sodium Benzoate, Sorbic Acid, Caprylyl Glycol, Boron Nitride, Hexylene Glycol, Polysorbate 60, Ethylhexylglycerin, CI 77491 (Iron Oxides), CI 77492 (Iron Oxides), CI 77499 (Iron Oxides), Sodium C14-16 Olefin Sulfonate. OMG it's potent! I only need a pinhead amount mixed with my mineral SPF. It's not at all orangey so suitable for pale and dark skin. Once mixed in, it settles to a subtle glow, not at all blingy or shimmery. When my legs make their annual outing in summer I will be mixing a few drops into my body lotion for a bit of tan. I've even experimented using it as a bronze cream shadow - also nice for summer. I love this!!! I mix this with my moisturiser & it gives me a beautiful bronze glow that evens out my skin tone - new holy grail item !!! I am in love with all of the Drunk Elephant products but I found this one somewhat underwhelming. It is hard to notice the actual benefits, and whilst it swatches beautifully, it isn't concentrated enough on darker skintones. I applied makeup on top and it began to pill. However, I did like it as a natural base and just concealed where necessary. I mix this with my moisturiser and it gives me a nice, subtle, light bronzed glow - perfect for spring/summer to give your face a little colour without sun!